The Health and Safety Executive has published new guidance on safety in window cleaning. The guidance is aimed at window cleaning companies themselves, but will be of relevance to designers, owners and those involved in maintenance of buildings. Window cleaning is a hazardous activity and the risk of falling from heights is one of HSE's current priority programmes. Every year several window cleaners die at work and many more are seriously injured. 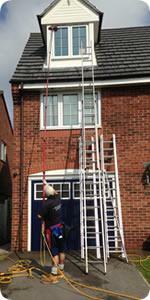 HSE is not attempting to ban ladders or stepladders, but ladders should not be the automatic first choice of access. They should only be used after a suitable assessment of the alternatives and the prevailing site conditions. The new legislation puts the onus on you, the customer, as controller of the work, to ensure that any work carried out is not done at height if it is safer to do so from the ground. If your window cleaner is not compliant to 'Working At Height Regulations' as controller of the work you (the customer) can be prosecuted by the Health & Safety Executive. A L Window Cleaning Bolton use the latest water fed pole system we are able to clean your windows up to a height of 60 feet without the need to use ladders. Our reach and wash window cleaning system ensures complete compliance with the latest health and safety regulations and protects your privacy.